Have you ever used widescreen LCD computer monitors? Over a period of several years, I went from a 15" CRT monitor, to a 17" CRT monitor, to a 20" CRT, then moved to a 19" LCD widescreen monitor. The last time I bought a monitor, however, I purchased a 24" LCD monitor. Why? These days I use my computer for more than homework and games. As a professional editor, I need more 'real estate' to work with. The wider monitor makes it possible for me to open two versions of the same document on the screen and still have resolution to see both documents. It makes comparing side-by-side documents so much easier, and therefore saves me loads of money on printing costs. I still have to print quite a bit, but at least I can curtail some of my office expenses by using the wider monitor. Just as important is the flat panel on the monitor, which allows me to push it further back on the desk. I no longer feel like I will fall in, like I did with the CRT I had. It was so huge, I couldn't push it back far enough, since it would have forced a hole in the wall behind my desk if I had pushed it far enough back for comfortable use. Some LCD monitors, such as the ViewSonic pictured here, even have built-in speakers! For professionals who need more screen room, I highly recommend widescreen LCD monitors. With 27" of real estate, this widescreen matte LED monitor is my dream monitor. The 1920-by-1080 resolution is perfect for my work PC. Maybe someday soon, I can get one of these! The first commercially available computer monitors were CRT (cathode ray tube) monitors. Much like older televisions, these had a large glass tube on which the picture was projected. This made the monitor too large to fit on small desktops. When laptops were invented, LCD widescreen monitor followed. LCD monitors usually use a fluorescent light called a backlight behind the flat panel. Some monitors use LED lights instead of fluorescent lights to backlight the screen. The screen may be either glossy or matte. Matte screens diffuse the light a bit, helping to prevent eyestrain. The resolution is an important detail. The resolution is determined by the number of pixels per inch the monitor can display. 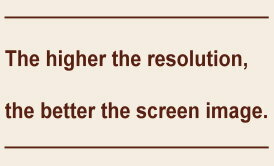 The higher the number of pixels, the higher the resolution is. Resolution an especially important consideration if you are working with or creating computer graphics.